GALION — Tuesday’s Galion City Council meeting was short and sweet. Seven pieces of legislation — three on their third readings — were passed with little or no discussion. “We’re also working on a possible land donation of several acres that will help in the further development of that area,” he said. 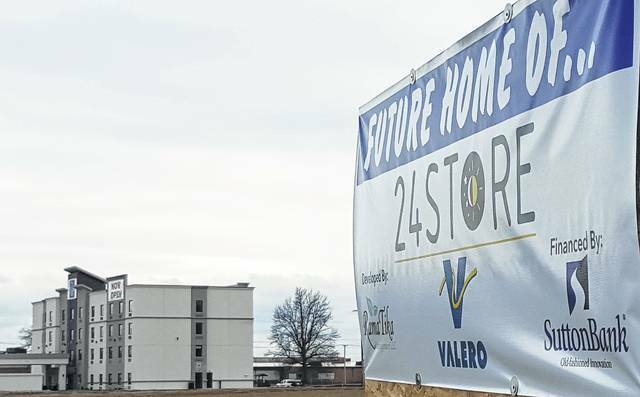 A construction timeline for the Valero site has not been finalized. A sign announcing the new business went up last last week. Rama Tika Management Company of Mansfield is the developer for the new project. Valero operates a service station off U.S. 30, near Ohio 314 and West Fourth Street. More recently, the company opened a facility at the intersection of West Fourth Street and North Home Road in Mansfield. O’Leary also announced that plans to do pavement improvements on Ohio 598 have been scaled back. Pavement work will only be done on the stretch of Ohio 598 between Heise Park Lane and Carter Drive. The mayor also said money saved from cutting back on that project means plans to correct some issues on Charles Street in the area of Granny’s restaurant are closer to fruition. A recent letter to the editor in the Galion Inquirer encouraged residents to attend tonight’s utility commission meeting to air comments or concerns about a much-talked-about electric rate increase. A decision on whether rate increases will occur has not yet been made. Although data being used to help decide the issue of a possible rate hike was expected to be delivered today to council members and city administrators, that discussion is not on tonight’s meeting agenda. There are no plans to discuss a possible rate hike, according to commission head and city council member Mark Triplett. “Of course anyone can come anytime and express their opinions at any meeting,” said council president Carl Watt. Seneca County Area Transportation has taken over public transportation in the county, not only for senior citizens, but for residents of all income levels and ages in Crawford County. O’Leary said there have been preliminary discussions about possibly utilizing the Big Four Depot for office space for the transportation agency. He said funding methods are being considered to remodel and upgrade the inside of the depot to make the possibility feasible. A pavilion is being built on the grounds of the Big Four Depot in an effort to make that area more popular. City Council members Jim Hedges at Thomas Fellner were absent from Tuesday’s meeting. Ordinances passed as a third reading included one that set a price for rental of the South Street Commerce Center, (formerly owned by HTI, but now owned by the city). After talking with real estate and business professionals, it was determined that the monthly rent for the nearly 285,000 square foot facility will be $10,500 a month. The ordinance goes into more detail about lease agreement that may be signed. Council also passed an ordinance that allows the city to lease unused property at the airport to farmers. Approximately 71 acres are available. That also was a as a third reading. The third items passed on a third reading was the adoption of a financial policy manual for the city. Approved on second readings were an agreement for the YMCA to manage the Heise Park pool this summer at a rate of $96 for every hour the pool is open; and an ordinance that does away with a requirement for the City of Galion to have to provide a 25 percent match for Freese Foundation grants. This passed by a 4-1 margin, with Susan Bean voting against the changes. Some minor budget appropriations were passes as was an ordinance to spend approximately $9,000 to upgrade the computer billing system at the airport, which when completed means, credit card usage will be available there.